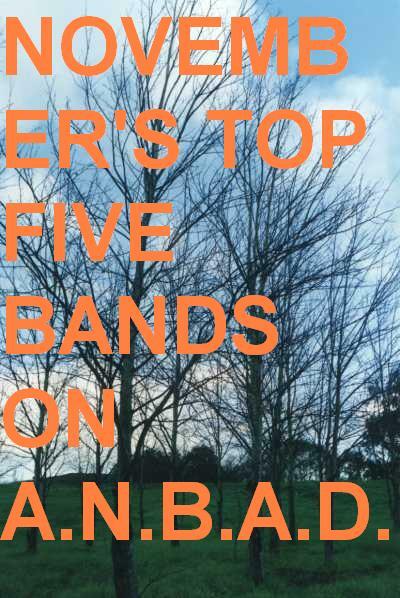 >The Top Five Bands in November on A New Band A Day! November is the least fun month in many ways. With the crippling cold, the leaves falling dejectedly from the trees and the prospect of Christmas just too far away to be properly exciting, you can be left scrabbling around for any viable crumb of comfort. Fortunately, on ANBAD, we’ve had a bumper month of excitement to compensate, what with all the fancy-pants website redesign, new writers, the thrilling ANBAD eBook and the emergence of My First Hate Email. 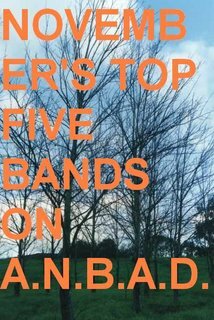 And this is all before you consider all the great bands that have swilled around the place like drunken sailors on shore leave. No wonder I’ve hit the Meth even harder than usual these past four weeks. Phew! A busy, fulfilling month indeedy. BUT WAIT! It’s December now, which can only mean one thing: rampant consumerism, over-consumption and shameless End-Of Year Best-Of Lists! Starting this week! Keep them peeled! Posted on December 1, 2008 by Joe Sparrow. This entry was posted in Uncategorized and tagged Round Up. Bookmark the permalink. ← >Today’s New Band – We Fly Ships PLUS! Hatred!